In 1986, history was made when Jeanne Moutousammy-Ashe published Viewfinders: Black Women Photographers (Dodd Mead), the first book to showcase the history of African-American women behind the camera dating back dating back to 1866. It spanned more than a century of work, showcasing the work of artists whose work had gone largely unrecognised in photography, which the author described to the Chicago Tribune as a traditionally racist and sexist industry. The book spoke to Laylah Amatullah Barrayn, a young photographer from Brooklyn, who wanted to see more. As years passed, nothing occurred – so Barrayn took it upon herself to be the change she wanted to see in the world. In 2006, she and photographer Adama Delphine Fawundu put together a prototype for the project that would become MFON: Women Photographers of the African Diaspora. MFON is a biannual journal that will launch with a book of the same name featuring work of 100 women from across the diaspora, including Ming Smith, Delphine Diallo, Émilie Régnier, Lauri Lyons, Noelle Théard, and Dr. Deborah Willis, who wrote the introduction. MFON is named for Mmekutmfon “Mfon” Essien (1967 – 2001) a visionary Nigerian-American photographer who died from breast cancer the day before her photographs from The Amazon’s New Clothes, opened at the Brooklyn Museum of Art in the acclaimed exhibition Committed to the Image: Contemporary Black Photographers. With the spirit of Mfon guiding their journey, Barrayn and Fawundu persevered, creating the book through a grant from the Brooklyn Arts Council and crowdsourcing through GoFundMe. Photographers in their own right, Barrayn and Fawundu, know exactly what it takes to make great work. Together they reviewed more than 1,000 works created by women around the world, and honed their selection with precision to create a powerful look at the heart of photography through the eyes of Black women from all walks of life. From the work of 13-year-old Fanta Diop, a native of the South Bronx, to 91-year-old Mildred H. Jackson, who reflects on Harlem in the 1930s. Barrayn and Fawundu speak with us about their experience creating MFON, spotlighting the work of six artists featured in the book whose unique perspectives and incredible styles brings fresh new visions, original ideas, and innovative thinking to the art form while simultaneously giving us an inside look at the multidimensional experiences of Black women from every corner of the globe. MFON is a vital contribution to art, photography, and book publishing. Please speak about the necessity for creating a book dedicated to the work of Black women photographers. Laylah Amatullah Barrayn & Adama Delphine Fawundu: MFON is a historical document on the history of photography. It also serves as a global contemporary voice of women of different generations and genres. Since the publication of Viewfinders, there hasn’t been much of an update. Several generations of these photographers have passed and it was time to create a document around their works. How did Mmekutmfon "Mfon" Essien inspire you as a woman and an artist? Laylah Amatullah Barrayn & Adama Delphine Fawundu: Born in Ikot, Nigeria, and raised in Baltimore MD Mmekutmfon “Mfon” Essien was magic, elegant, generous, and clear. Petit in stature but a giant in presence and fortitude, she was special. The meaning of her name, Mmekutmfon, in her native Efik language is translated as “I have seen the goodness of God.” When Mfon looked at you, she really saw you. It was an honour to be caught in her gaze. She reflected light. Mfon courageously and triumphantly captured beauty and space, creating more room for us to define, defend, and demand truth through our own image(s). Her work is a radical, revolutionary document of self-preservation while shifting the power of the gaze, often hypercritical and multi-layered, to oneself. Her work reflects our collective flawed and sacred beauty on our own terms as an undeniable source of strength and an ultimate defiance of “others” standards of beauty. Mfon stood tall and grounded in her dignity and grace as all our talented photographers featured in MFON do. Born in Kingston, Jamaica, and now residing in Brooklyn, Samantha Box has been documenting the homeless LGBTQ youth of New York City since 2005, when she was a student at the International Center of Photography. Given the assignment to photograph a community space, Box came upon Sylvia’s Place, the only emergency shelter available to the estimated 4,000 LGBTQ youths who have no home to call their own. Her on-going project, Invisible, makes us look at what so few see. Laylah Amatullah Barrayn & Adama Delphine Fawundu: Samantha Box has made significant contributions to the way we view the LGBTQ community. Her powerful works reveal perspectives the social issues affecting young adults of colour within the LGBTQ community in New York City. We came across her works through the Open Society Foundation’s Moving Walls award and exhibition. The photographs chosen for MFON emphasise the necessity of building family structures within the LGBTQ youth communities of colour. Although Box focuses on a specific community within New York City, her work reflects communities throughout the African diaspora and the world. Laylah Amatullah Barrayn & Adama Delphine Fawundu: Fanta Diop is the youngest photographer in MFON. Laylah had the opportunity to meet her at the Bronx Documentary Center, where Diop is a member of the Bronx Junior Photo League an after-school program at the BDC. Diop brings the perspective of a first-generation Malian-American teenager living in the South Bronx, adding a significant perspective to the conversation around immigration. Through her lens, we are given a glimpse into the life of her elegant grandmother who owns a small business. Diop comes from a family of hard-working women trying to give their daughter the best opportunity to succeed. The works that she is producing at the tender age of 13 is evidence that she will be successful in photography if she sticks with it – she has already been profiled in The New York Times. Originally from Togo, Hélène Amouzou now lives and works in Brussels, Belgium, where she creates powerful and enigmatic photographs reminiscent of Francesca Woodman, but takes a very different approach, as they explore the relationship between women and their private abode. Here, wallpaper peels, shadows and light dance, clothes hang and suitcases are suggestive metaphors. Amouzou is a woman in search of herself, examining ideas about the role of identity in our lives. Laylah Amatullah Barrayn & Adama Delphine Fawundu: Delphine came across Hélène Amouzou’s work while researching women photographers who chose to use themselves as the central characters of their work. She was preparing for a workshop for women photographers that she facilitated at the African Artist Foundation in Lagos. 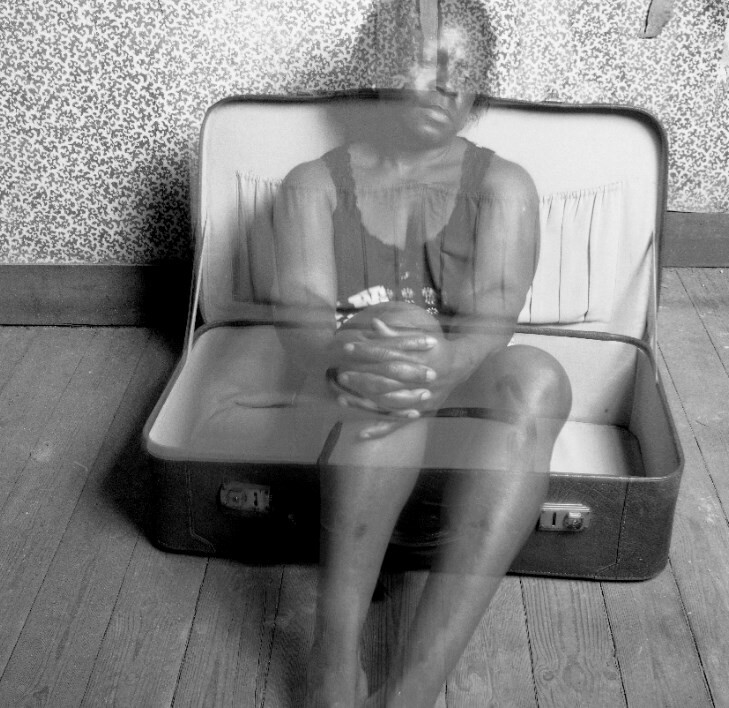 Amouzou’s photographs are striking as they depict her translucent body embedded within the wall and seating in a suitcase. Her work invites contemplation of the impact that migration within the Western world has had on African identities, given the historical disruption of colonialism. How is identity negotiated? What is gained or lost? Although Amouzou is from Togo, this is something that immigrants can relate to regardless of where they are from. Hailing from Lagos, Nigeria, Jenevieve Aken focuses on social documentary photography, self-portraiture, and the transforming urban condition. She has participated in the past three editions of LagosPhoto and also participated in the African Artist Foundation’s Female Artist Platform in 2014 in conjunction with Ford Foundation. She also works as a model and was awarded “Model of the Year” by MTN/British Council Nigeria in 2011. Laylah Amatullah Barrayn & Adama Delphine Fawundu: Jenevieve Aken participated in the women in photography workshop that Delphine facilitated in Lagos back in 2012. Interestingly enough, MFON photographers Renee Cox and Hélène Amouzou were two of the photographers that were studied during that workshop. In MFON, we prominently feature some of her powerful photographs from the series Great Expectations – Miss Aken, which speaks to how marriage impacts Nigerian women. The work also eloquently brings to the discussion the difference between art and exploitation when representing a woman’s body. A visual artist living in Ithaca, New York, Nydia Blas weaves intimate stories through a Black feminine lens, creating a spellbinding portrait of the complex layers of existence. Drawing upon her own experiences as a girl, woman, and a mother, Blas creates allegorical images that engage with ideas of circumstance, value, and power to examine the relationship between resilience and resistance. 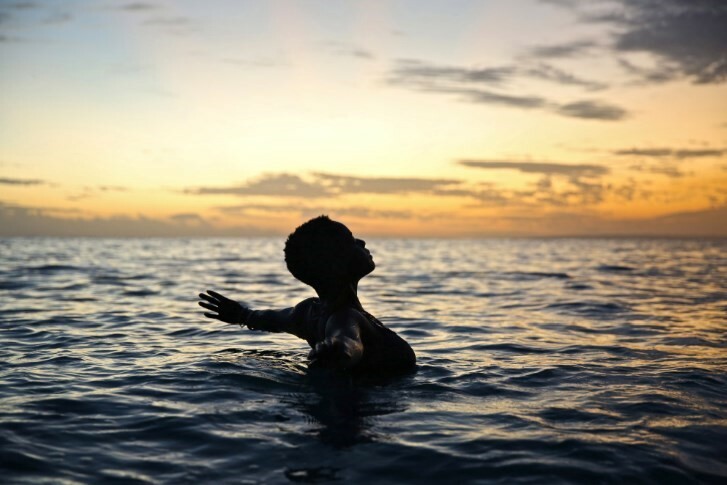 Laylah Amatullah Barrayn & Adama Delphine Fawundu: We were both blown away by Nydia Blas’s photographs that create magical narratives around young girls of colour, which we saw during her residency at the Center for Photography at Woodstock. 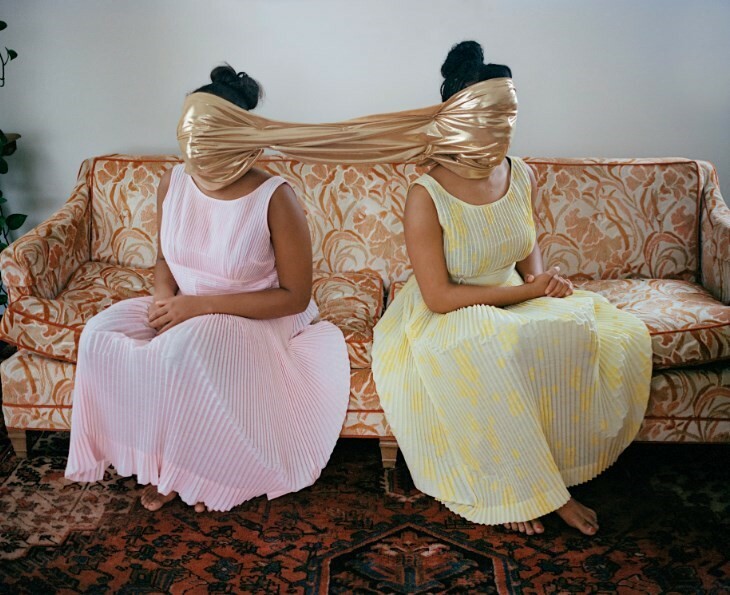 For MFON, we chose a photograph from her series The Girls Who Spun Gold. Here Blas examines the concept of seeing oneself through the gaze of others. Her photographs explore ways in which girls come to understand themselves while simultaneously becoming aware of the expectations of being gendered, racialised, and sexualised. Born in Kingston, Jamaica, Sabriya Simon moved to the island of Antigua just before turning five years old. She returned to her homeland in 1998 to attend University, getting degrees in Psychology and Applied Organisational Psychology. During school, she got her first camera and began to teach herself the art, documenting the landscape of Jamaica and the women who inhabit it. Simon’s work is natural and intuitive, embracing the essence of the Goddess in her many forms. 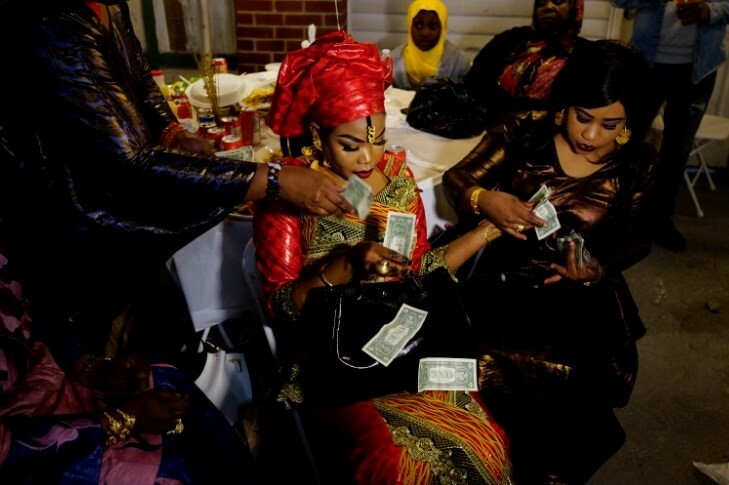 Laylah Amatullah Barrayn & Adama Delphine Fawundu: Sabriya Simon sheds light on how the ancient spiritual practices hailing from the continent of Africa have transformed within the diaspora over hundreds of years. Her works are important in larger conversations about identity, spirituality, and cultural hybridity, demonstrating that even colonialism and enslavement could not stop the powerful spiritual practices of the people.